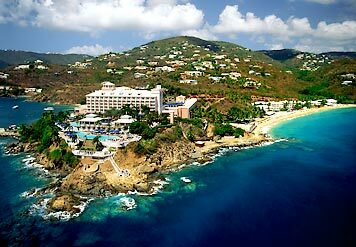 The Marriott Beach Resort is a luxury resort perfect for vacationers wishing to indulge in their Caribbean getaway. This beach resort is perfect for your Caribbean honeymoon. Indulge in the best amenities on the island and the seclusion of a private beach right in front of your resort. Frenchman’s Reef & Morning Star Marriott Beach Resort is located on the southern part of the islands, adjacent to the one and only Virgin Islands National Park. The Marriott is conveniently located six miles from the airport, and three miles from downtown. Mariott Frenchman’s Reef Resort offers 451 rooms and 21 suites. Relax in your room that blends the island atmosphere with optimal comfort. Excite your eyes with the vivid island colors and gorgeous balconies that overlook the dazzling Caribbean ocean. The Marriott luxury resort offers nine venues in which you can dine and drink on the best tropical foods without ever leaving the resort. Swim up to the Pool bar and sip on a refreshing drink as you watch the sun set over the picturesque Charlotte Amalie Harbour. The Marriott Beach Resort features four pools, a spa, fitness facilities, and endless island activities. Enjoy the classic island activities such as jet skiing, kayaking, sailing, scuba diving, snorkeling, tennis, volleyball, water skiing, and more, all located right in front of the resort’s private and immaculate beach.